Shortly after moving into our house my parents offered us a nice-sized butcher’s block from the house they were renovating. I don’t remember if we had an idea of what to do with it at the time, but we took it. In early 2009 we decided that we’d build a center island. As a test we finally took that butchers block and put it on sawhorses in the kitchen. I remember remarking that I didn’t want the sawhorses to be a permanent fixture. Alas, I am a creature of habit and it would be more than two years before those sawhorses would be replaced. In the summer of 2009 I did take the butchers block and cut it down to fit the area a bit better shaving a few inches off both the width and the depth. Later in the fall I would actually begin the project in ernest. Although there was a bit of “biting off more than I can chew” (which seems to be my thing), and a few delays due to life, this weekend I was finally able to complete final assembly. I did break down and buy drawer fronts and cabinet doors from FastCabinet.com, who I also used for the doors on the built-ins in the dining room. I also bought unfinished oak table legs, however they weren’t long enough so I did have to turn my own feet which came out pretty well. Other than those things (and hardware), everything else was built from scratch. I didn’t take a lot of photos of the construction, but what I did take are available in my center island set on flickr. Its not perfect, but I’m pretty happy with the result (and the thing weighs a ton, even without the butchers block, as Cara can attest to). I do have to finish up a few of the shelves, but I went ahead and started a new project today, a new bed for Zee. I’m going to try to make this a few week process, and not a few years. I’ve been seriously neglecting my blog. Call it a casualty of Facebook. It’s really a shame too, this blog is part voice to the world/part diary of life. Facebook does neither very well. Admittedly it’s a lot easier to write one or two sentences in a Facebook update, but all the same it doesn’t capture the path of life. I actually completed the living room & dining room a while ago (actually right before Christmas 2009), but I finally got around to taking the “after” photos that I’ve been meaning to take for a while now. I didn’t keep track of expenses or time (I should have), but I figure there’s easily hundreds of hours invested in this. Mostly my own time, but my father helped out on a few things, and I had several friends over two years ago to help. This was a project that was huge, much, much larger than I had anticipated. I will never take on a project of this scope again. Owning a house is fighting chaos. Hopefully you can fix stuff quicker than it breaks. This has been a tough fight since Zee was born. There just doesn’t seem to be enough hours in the day to take care of everything that needs to be taken care of. As a pool owner, probably the biggest fear you have is that one day, a catastrophic failure will dump the contents of your pool in a matter of minutes. Today that fear was realized for Cara and I. The story starts months ago when I got home from work and the pool pump wasn’t running. For over a week the pool pump was off (and the pool turned a nice shade of green), then I was able to get it limping along which helped it from turning into a complete cesspool, however it wasn’t really up and running until a few weeks ago. By then it was time to close the pool, but before I could do that, I had to return it to a somewhat clean status. Our kitchen is pretty big, it’s one of the many things we love about our house. One of the issues, however, is that it feels like there is wasted space, especially considering that the counter space is pretty limited. It’s ironic that with such a large kitchen there is only about a 5’x4′ space to do food preparation. When my parents were renovating the kitchen area of their house mansion they were getting rid of the butchers block that was there. 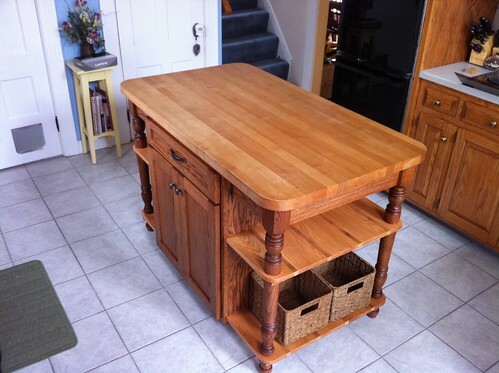 We carted the butchers block home thinking it would make an excellent top to a center island.